Every time I return to Nigeria, I confront an ever-present conundrum in my life. It is enmeshed in my art-making, my intellectual work, and in my cyclical personal struggles with existence. Where is home, and what does it mean to say one is home? I can never rest with this question. So I have returned to a kind of home here in the Delta. Benin City lies on the western fringe of the Niger Delta region, which stretches East to Calabar. 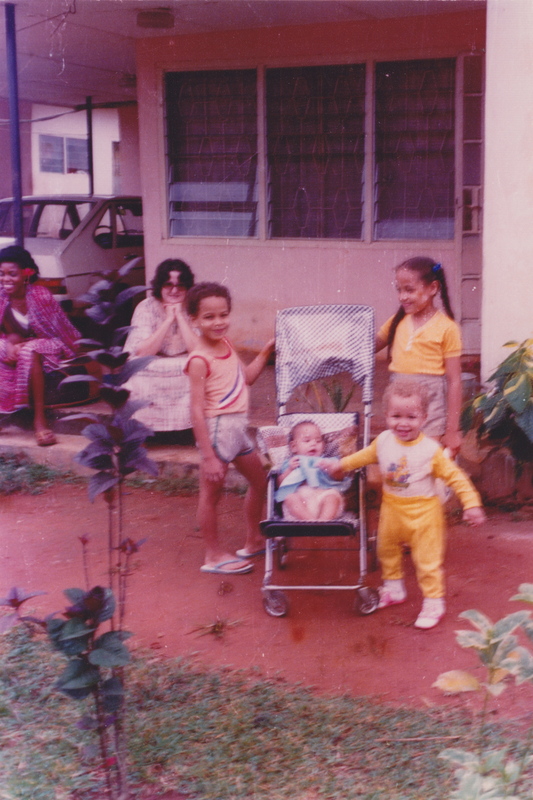 My family lived here in Benin in the 70s and 80s, and we went to Warri on most weekends to visit our grandparents. Warri is where I feel most intimately attached. Perhaps this is because I associate some of my happiest childhood memories. It was where my grandparents were; I played with my cousins there; and we spent our most relaxing times as a family there—weekend retreats, holidays and special occasions. Perhaps too, some of my being compelled to return has to do with what some poets and writers write about…being connected to the very earth of a given place, or a place being in the blood. Yet, coming here, for me, is like returning to a dysfunctional household. It is at once familiar and unsettling. This is not a home that I have chosen, or one that I would even choose if given the opportunity. It has chosen me. As you leave Benin and cross the border from Edo State to Delta State (where Warri is located), the patchy savannah quickly turns into lush forests. You pass countless palm and rubber plantations on the freeway, interspersed with villages that are tucked away from the main road. Nowadays these are indicated with little green signs…Ologbo, Okha, Obayantor, Koko; whereas 20 years ago, the only things indicating their existence were abrupt, narrow footpaths. There was an “in-the-middle-of-nowhere” impression I used to get passing by them. What is it about having a sign or label marking them now that makes them suddenly exist in space (and time)? It is curious that these little green signs actually changed my awareness of these villages, which I’ve passed before and which have existed long before I ever did. I made these observations on my way to and from Ogharra yesterday. We went to visit my cousin Jite and his family. Ogharra is about a half hour drive from Benin, a third of the way to Warri. I have not been (home) to Warri yet. Being away for so long has definitely colored my sense of belonging. It is not the belonging of my childhood, or even the belonging I felt when I came ten years ago. It is now a refracted, even disjointed belonging. It is as if my Americanness has finally settled in, and I can no longer extract it and set it aside while being here. In its settling, it has actually shifted some parts of my Nigerianness I might have taken for granted. Language is the clearest example of this. Even though I understand and even (from time to time) think in pidgin, my tongue is finding it very hard to release the words from my throat. Before, it was only a matter of being around fellow Nigerians for an hour or two, or spending a couple of days here before I would slip in and out of it. Now, not only am I finding it hard to utter the words, but my American accent is so strong that it grips everything I say. I am self-conscious. I now worry (perhaps irrationally) about how I will wrap my tongue around my father’s language, Urhobo. Urhobo, a language that sounds like water. The Urhobo are a riverine people. The language is full of aspirated consonants, which are highly unlikely in English: vw’s, vb’s, wh’s that come out sounding like soft b’s or v’s depending on the word, rhie’s, rho’s, gh’s, kh’s that are almost swallowed at the back of your throat. It is also peppered with syncopated gb’s and kp’s, sharp t’s and rolling r’s. My grandmother’s dialect is softer than my grandfather’s. My father’s generation learned my grandfather’s more aggressive dialect. It is what I will have to settle with, although I miss the quiet rhythm of my late grandmother’s raspy voice…Mewe’s voice. My dreams are vivid here too. I can’t tell if it is due to the medication I am taking (Mefloquine is said to cause bad dreams, and hallucinations in extreme cases). These are not bad dreams, but they are vivid. When I wake up it doesn’t feel like I ever left reality. That is another thing I remember from my childhood here: having a very active inner- and dream world. Now, I am not trying to idealize or mythologize this experience in a Joseph Conrad sort of way. There is nothing dark or ideal (as in “primitive Africa”/“mystical Africa”) in any of this. But I do think there is something about the way time moves here, and the quality of the air and ground that facilitate (at least in me, anyway) a heightened sense of awareness. Then again, there are several other possible reasons for this that have nothing to do with time or the air: for example, my outsiderness, the rawness of everyday lived experience here that forces a sensational immediacy. I suppose this is how nostalgia works. The awareness, connectedness I speak of now, this slipped away over time as I struggled to come to grips with life in the U.S. I was very conscious of the loss. Whenever I return, it is as if I receive little memory packages of the world I used to occupy. It is in the smells, in the flavors of the food, in the quietness of the night, in the air itself…smoky, heavy…dense air. It is as if the weight of the air and the brilliant redness of the earth carry with them a story, or many stories. Words are not adequate. I wish I could paint it for you. It’s the middle of the day and it must be well over 90 degrees outside (something like 33 degrees Celsius). I’ve fallen into a kind of rhythm here, in just two weeks, and it feels like I’ve been here for longer. I wake up between 5 and 6 a.m., and have stopped being surprised that most of the people in my compound, including Efe, are also waking up. The roosters begin their crowing well before this time—each having its own distinctive call, which ends up being a kind of chorus. You can only hear this when there is no electricity (a regular occurrence), and all is still and quiet. The Harmattan air is cool and opaque. It’s hard to tell if it is fog or a mixture of smoke, dust, and fumes from the previous day. It can’t be fog, since we haven’t had a drop of rain since I arrived, and we are not expected to for a long while. It is Harmattan – the dry season. Things really get moving by 7 a.m. By then, you can start to hear car engines revving up in the neighborhood, and people moving about: gates opening and closing, compounds being swept, and various cooking smells emanating from old cooking pots outside on propane burners. We are always in a bit of a rush to take good advantage of the coolness before the real day’s sun rises over us. It is a punishing sun. I find that most of our running about happens before noon, wrapping up most serious movement around town by 2 p.m. in the afternoon. By then the sun is very high and the heat starts to seep into your core. You grow a bit lethargic, with the added weight of sweat mixed with exhaust fumes and dust settling on your skin. It is normal. My small flat – a studio apartment in a hostel known as Chicago – is equipped with an air conditioner and a big ceiling fan. The curtains are light blue, transforming the wicked light of the day into a tranquil softness. These all create an oasis effect when I come home mid-day. Thankfully, when there is no electricity, a petrol-fueled generator powers the AC and refrigerator. It’s a very loud machine, sounding very much like an industrial lawnmower. I feel guilty for having it. No one else in the compound has one, and when the lights go out, they have to suffer in the heat. The generator emits a profuse amount of fumes and the noise is so loud that at night I insist on keeping it off, despite Efe’s protestations that it is normal. He also tells me not to worry about the others not having one. If they could afford to have one, they wouldn’t be so shy to use it. Efe thought about hooking up our entire floor to the generator (it’s capable of carrying a full house), although he knows from experience that they would not only refuse to contribute to its upkeep and refueling but would also abuse their use of it, attaching any and all appliances they own, forcing it to overload. 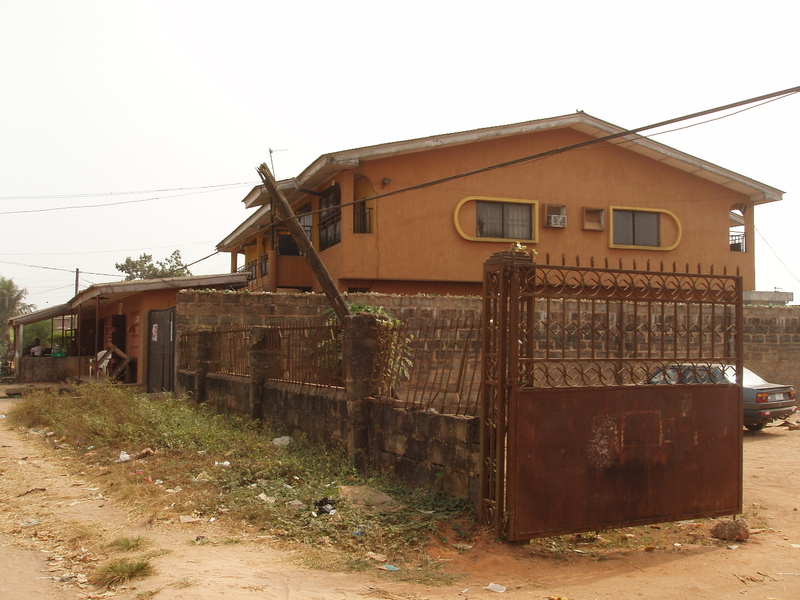 The compound is a motley collective: an old man who lives alone stays on one end, a few young men and women (some are coupled) who live and work in Benin, and the rest are students who go to school here at the University of Benin (UniBen). Efe has introduced me to some. There are two hefty girls who are my neighbors, but they are not around at the moment, since most students are away for the holidays. We have a cousin, whose name is Sarah. We share a grandfather; her grandmother was one of my grandfather’s several wives. She lives on the corner downstairs. There is a shady character named Jeff, who does his best to present himself as a worldly man of all things American (I often get greetings of “what’s up” or “what’s shaking” when I pass by). There is The Speaker, a zany character with a lazy eye and an abnormally big head. His real name is Emeka, but they call him The Speaker around here because he’s got crazy notions about all sorts of things, constantly having something clever (in his mind, anyway) to say. He’s not aware of the nickname. There are a couple of Hausa men who guard the compound gate at night and who live in the row of ground-level rooms near the compound gate with their wives and children. Every morning at around 6:30am, one of them sweeps the entire compound while I jump rope in the corner. Efe reminds me how to greet in Hausa, but I keep forgetting, so I just say, “good morning.” Then we have Amos, who lives below me. Amos loves his music, and he’s got a real sound system. He’s our entertainer. Whenever there is electricity, he treats us to all sorts of sounds, from Igbo gospel music to Nigerian Hip-Hop, American Ballads, and South African Reggae. However, if there is a song he’s in love with at a given moment, he will repeat it seemingly without end. 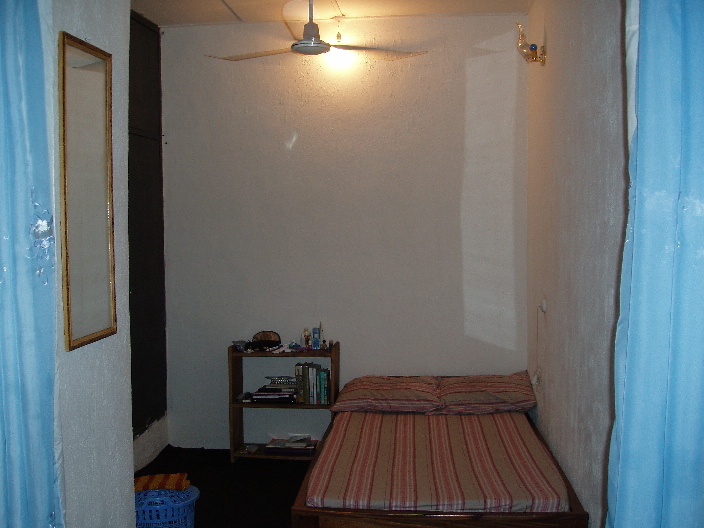 Compound in Chicago hostel, Ugbowo. 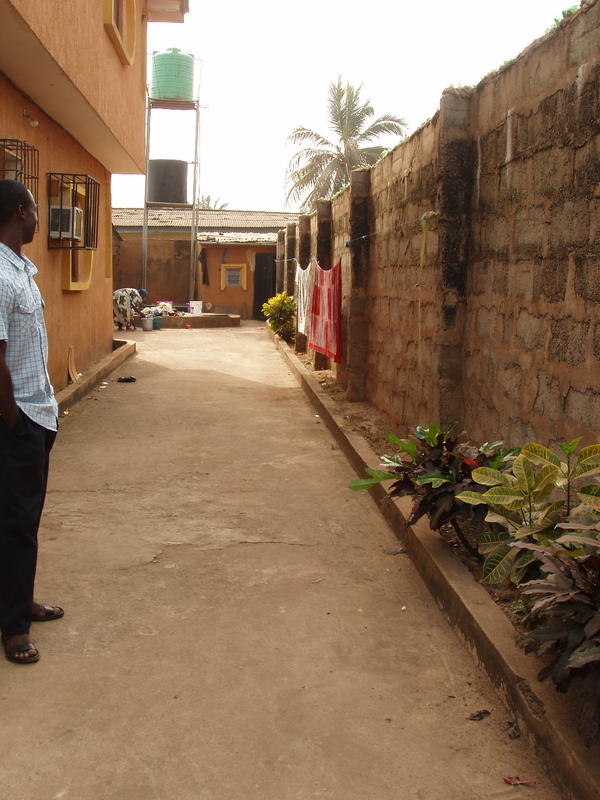 Hyble, a very sweet young man with very fine features (almost feminine), is well-known in the compound. Apparently, he runs most of the errands that need to be run around here. From morning until night, one can hear (not “Hyble,” where you pronounce the “Hy-” as “Hey-,” but…) Aaaybo…AaaaayBOooo… in all sorts of high and low pitches. I had even started to wonder if his name was really Abel, if I was mispronouncing it. He insisted that it was Hyble. I wonder why he doesn’t correct the rest of them. If there were a parrot in the compound it would be well acquainted with this sweet-faced boy, offering him a symphony with multiple arrangements. Hyble fetches water, sweeps out rooms, runs to buy bread, eggs, or tea at the junction, and washes clothes. The funny thing is that none of them pay; none, except Efe and I. What’s worse is the way they call on him and abuse him daily when he doesn’t come as quickly as they want or doesn’t do things the way they like. I don’t know why he does all this for them, and for no pay. According to Efe, he will withdraw his services from the non-paying folk in the New Year. As for me, Hyble washes my clothes (minus my personals), fetches water when there is no electricity, and runs to the junction for things like eggs, bread, tea. It feels really strange to have someone take care of these things, but it is also unthinkable to folks around here that I do these things for myself. Most of it has to do with status—my skin color, my Americanness, and my income. If I can afford to employ someone to do it (it costs me about $5.00 a week), then I am obligated to enlist these services. Efe also pointed out that none of the girls on my floor fetch their own water; if they don’t why should he let his “white” cousin fetch for herself? To really consider the reality, it takes so much effort to do these basic things—due to lack of running water or electricity or the lack of convenience stores – I wouldn’t have enough time in the day to do these things as well as collect data and do research. Privilege. I’m very well aware of it. I’ve been in Nigeria for a bit over a week now, and I’m settling in well. So far so good, gastronomically (it has been several years since my tummy was last here, and it is inevitable that I will come down with what I like to call “gastronomicus apocolypticus” soon after arrival), mentally (my malaria pills haven’t induced any hallucinations or depression…yet), and emotionally (it has made a real difference that I am here on my own terms). Once I finished my orientation at the U.S. Consulate, my cousin Efe met up with me. He is my main partner in this great adventure. We spent a good amount of our childhood together, living at one point in the same neighborhood. It took us several hours to book a vehicle to transport us from Lagos to Benin City, and I was getting nervous because we had to get to Benin by nightfall. It was already 3:30pm when we got started, and it takes 4 to 5 hours to reach Benin. Efe knows which lines are the safest and most comfortable. We secured several seats in an air-conditioned 15-passenger van. I had eight months worth of supplies, my research equipment and a conservative amount of clothes. I also had an entire suitcase devoted to gifts and necessities requested by family members back home – baby clothes, books, watches, perfumes, creams… Given the throngs of people waiting in the beating sun to make this same journey, I was hyper visible as I corralled my luggage, to my several seats in this comparatively luxurious van, which was still packed full. 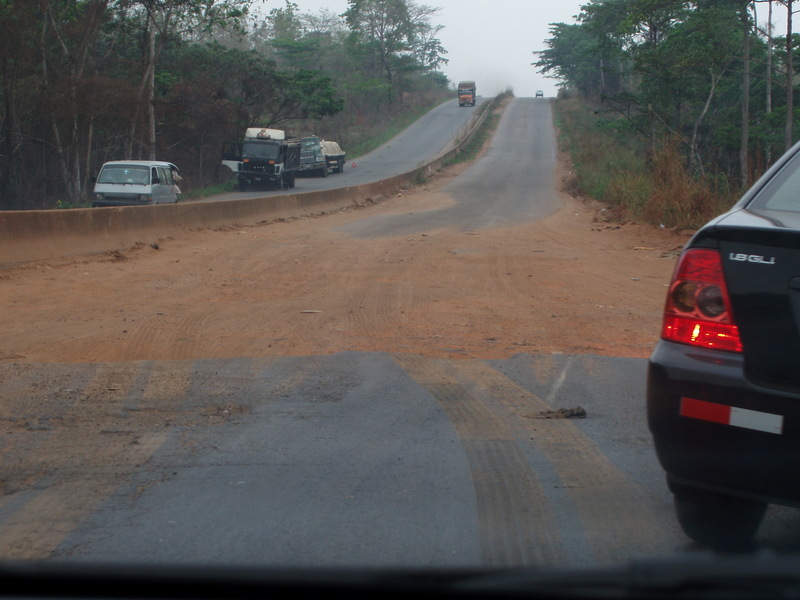 The journey to Benin was an elegy of faith. The driver moved fast, maneuvering deftly around potholes the size of small swimming pools and tracts of highway blocked off due to ill repair and disuse. You often see farmers selling their produce in the areas near the potholes because vehicles inevitably have to slow down. We actually passed by a herd of cattle grazing on an overgrown tract of freeway. In those cases, the driver, in a flash, will switch to the other side, confronting on-coming traffic, converting what should be a 4-lane freeway into a 2-lane highway. The way drivers communicate their presence in this circumstance is to flash their lights to on-coming traffic. They continue this until their side of the road opens up again. His speed rarely changed. Then there are the security checkpoints. Usually this consists of a band of mobile police, dressed in fatigues and armed with one sort of weapon or another…usually large, automatic guns. They block the road with long timbers and flag vehicles to slow down or stop. Their job is to ensure travelers’ safety because Nigerian highways are notorious for harboring armed robbers who can ambush you at any point. However, there is a price for this “security.” Most of these men require a “settlement” if you don’t want to be delayed for any extended period of time with harassment over insurance, registration, or license. Thankfully, we didn’t pay out too much. Apparently my fair skin and American aura put them off from being too rough or upfront with their business. Every once in a while, they jovially waved us along with one or two Oyibo jokes (Oyibo is the pidgin term for foreigner or white person). I couldn’t tell if our fellow passengers viewed me as a blessing or a curse, either delaying or speeding up the journey. So, we went along with the syncopated rhythm of potholes, fast maneuvers, and loitering men. We arrived in Benin well after nightfall, the smell of car exhaust fumes, kerosene lanterns, and roasting plantain swirling together to make a perfectly nauseating mixture in the thick night air. Efe moved with a speed to find a taxi while I waited with his traveling partner and my entire luggage beside me. I was very much out of place: a just-landed American, with the scent of newness all over me. I had arrived, my heart pumping, my eyes alert, my ears tuned. It feels surreal that I am here now. Here, in Lagos, breathing this air, occupying this space, in this time. I am now, finally, in my room at the American Consulate guest quarters, where I am staying for the night in order to make my orientation on time tomorrow morning with my Fellowship program. Landing: It was 28 degrees Celsius in Lagos, according to our flight captain. We arrived at around 8pm. I began to calculate what it might be like during the daytime tomorrow, if the nighttime low was 28 degrees. Immediately upon landing, our windows steamed up, and as we stepped off the plane and into the lobby, the air descended upon us: thick, heavy, and organic. I could smell the very dynamic and constant process of breakdown and decay. It is not a dying decay but a living decay; always in motion, constantly present in the process of living…a kind of layering of life here in the tropics…living detritus. That is the only way I can describe it. We had landed. After forming and reforming three different queues in the process of getting through immigration, each of us was plunged immediately into a frenzied madness. No matter how calm and composed we travelers were up until that point, this madness gripped each and every one of us, as if we were being controlled by some invisible remote control. There was no choice but to participate; if you relaxed, you lost ground to your more aggressive neighbor seeking and retrieving his or her luggage. Here begins the world of dog-eat-dog/each-man-for-himself/zero-sum calculations that is Lagos, indeed Nigeria. It took 2 hours to get my luggage. For most of us in the baggage hall, this was the case. We pushed and shoved over trolleys, which immediately were in short supply (each and every one of us had excess luggage…most, after-all, had come for the holidays). Josephine, the expediter sent by the Consulate to help me through the process, was distracted to say the least. Apparently, I was one of 4 flights she had to attend to this evening. I came with the third batch. In the mayhem, I managed to secure a position just behind some fierce-looking folks who had formed a blockade in front of the carousel. A couple of the men looked quite surprised to find me standing right behind them, cart and elbows waiting. They turned out to be allies, and I in turn was an ally to those behind me. Somehow, in that 2-hour stretch, we had formed a kind of fraternity. We had managed to create some sense of order out of the chaos. As the 2nd hour came by, we even began to cheer each other when one of us spotted our last bag. Each one of us left the baggage hall feeling a sense of victory under the layer of sweat and dust, blessing us as we crossed the threshold into the thick night air. I’ve checked in to my room here at the Consulate guest quarters, taken my shower, and am now ready to crash desperately on this bed! Oh, and no dinner. Thank God for Luna bars! To inaugurate my blogging adventure, I’d like to present a series of essays I wrote during a critical eight months of my life in Nigeria, between 2006 and 2007. I had traveled there to carry out my dissertation research. Much of it was spent in my hometowns of Benin City and Warri, with short periods in Ibadan and Lagos. I use the word “hometowns,” because I spent my childhood in these cities. My family left in the mid-1980s, when the military coups were ramping up in frequency and violence, and life had become unbearable for many families. Since our departure, the United States has become my home, but I still have a sense of rootedness in Nigeria. My relationship with Nigeria, and with the Niger Delta more specifically, is complex and complicated. This complexity informs how I move in the world, not claiming to be from any one place while feeling at home in several. This sense of multiple belongings has become a typical mode of being for many people living in the twenty-first century, so my experience is certainly not unique. My awareness of this sensibility was provoked regularly during those eight months between 2006 and 2007, and the essays that follow reflect my observations and ruminations during that time. I originally sent these essays to a group of close family and friends through emails. It was the most efficient way to send things from Nigeria at the time, where internet connectivity was patchy and electricity was not reliable. The series was not very thoughtfully called “Diaries of a Mad Wanderer” (or DMW), and it was structured as a series of journal entries. I had plenty of down time, and saw so much each day that I documented my experience with great commitment and discipline. What follows are edited versions of these original journal entries, shared with loved ones.